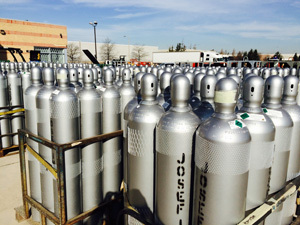 RICHMIX is Josef Gas’ line of welding gas mixtures. Fully recognized by the Canadian Welding Bureau, RICHMIX welding gas mixtures come in 2-part and 3-part mixtures of blended argon, oxygen, CO2, CO, Helium and Nitrogen. 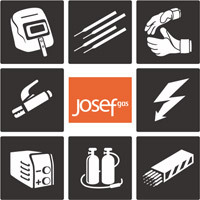 Before choosing a Welding Mix, please speak with us. We can walk you through the many things to consider, and make certain you get the RICHMIX that’s right for your job! Argon/CO2 welding mixes are most commonly used in Carbon steel MIG welding applications. All 4 modes of transfer can be used with Argon/CO2 blends. This blend is used with pulsed and axial spray transfer modes. It has a very broad penetration, and is one of the most popular mixes for Carbon steel applications. This blend is used with either pulsed or spray transfer modes. It increases the sidewall fusion rates in both modes of transfer, and generally improves toe wetting on Carbon steel with low levels of mill scale. In short circuit mode, the relatively low CO2 level translates to less heat for the weld material, thus less burn through in particular on thinner materials. This mixture is at the effective limit of axial spray transfer mode. It is a popular European blend used for a wide range of welding thicknesses. Its broad arc enhances the penetration profile along the weld material. And it can be used in short circuiting transfer modes and STT applications. This mixture helps to reduce spatter and improves the weld bead appearance on Carbon steel applications. Commonly used with the Short Circuit mode of transfer. Argon/Oxygen blends attain axial spray transfer at lower currents than Argon/CO2 mixtures. The weld pool is more fluid and the droplet sizes are smaller with Argon/O2 vs Argon/CO2. Argon/O2 blends also provide increased travel speeds, especially on thinner weld materials. Both stainless and Carbon steels can benefit from the use of Argon/Oxygen blends. This is a shielding gas blend of Argon and Oxygen. It is used for both Carbon and stainless steel applications. It is typically employed in applications that require high travel speed for sheet metal-like material thicknesses. It can be used on both pulsed and spray transfer weld modes. 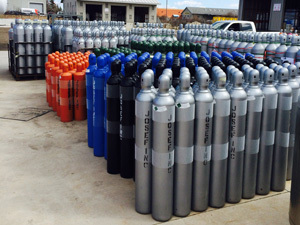 This shielding gas is similar to 102, but with a higher Oxygen content – 5% instead of 2%. It can be used with spray and pulsed transfer, and on heavier gauge weld material. Argon and Helium mixtures are used mainly when welding Nickel based alloys and Aluminum. The mode of transfer is either spray transfer or pulsed spray transfer. The addition of Helium provides a more fluid weld pool, flatter bead shape and increased travel speeds. Helium reduces the appearance of Hydrogen pores in welds using Aluminum and Magnesium fillers with 5000 series base alloys. The Argon provides excellent arc starting and promotes a cleaning action on Aluminum. Used primarily for welding Aluminum and stainless using the MIG process. It improves the penetration profile for Aluminum, Copper and Nickel applications. With a higher Helium content than RICHMIX 325, RICHMIX 350 provides greater heat input into the weld pool. This mixture with its high content of Helium increases the fluidity of the weld pool. It is used mainly in TIG welding of Aluminum on thicker base materials. Argon Hydrogen welding mixes are used for joining austenitic stainless steels in the GTAW process. The extra heat that the Hydrogen provides, allows the user to input more heat to the base materials while helping to improve the weld cleanliness. Also this blend allows the user to increase the travel speed over just pure Argon. This 2 part mixture is used as a shield in TIG welding applications. The addition of Hydrogen into the mix improves the cleanliness of the weld deposits, while maintaining an extremely high weld travel speed when compared to Argon and Argon blends. It is used mainly in stainless steel applications. This 2 part mixture is used in Plasma Arc cutting of stainless steels and Aluminum. A three part welding mix blend is popular for both Carbon and stainless steel weld materials. For short circuit transfer the addition of Helium in an Argon/CO2 blend broadens the penetration profile and reduces the tendency of incomplete fusion. For Stainless Steel applications, Helium additions of up to 90% in Argon and CO2 on short circuit transfers reduce spatter, improve puddle fluidity and offer a flatter weld bead shape. This 3 part mixture is one of the most popular of the short circuit blends for stainless steel applications. The inclusion of Helium into this mixture provides a flatter bead shape and excellent fusion. On pulsed spray transfer it is limited to stainless weld material thicker than 1.6 mm. This three part blend can be used on all modes of weld transfer. The high percentage of Argon reduces spatter on Argon steel welding of all thicknesses. It is a universal mixture that can be used with all types of Carbon steel, thick or thin. The 503 is a universal shielding gas that works well with all types of metal transfer. The precise amounts of Oxygen and CO2 in Argon allow for improved penetration and superior weld bead appearances over 2 part mixes.